That’ll teach you to go for a stroll among the graves! RR — indeed. One should never disrespect the dead. Be careful, Quilly! 🙂 I’d get back on that path and stay there if I were you. Jim — too late. Alas. Rod Serling’s ghost will haunt this blog post forever. Just imagine all the Critters that call that place home. Not a very good place to get lost. Bill — I think most everything here is dead … much scarier than critters. A nissing path and a missing Ellen! I guess it’s time to scream! Good one! Gemma — but can anybody here you from the Twilight Zone? Sounds like the opening to a good mystery! Barbara — or the end of a Twilight Zone episode. A cautionary tale about scoffing the spirits! Nice on, Quilly! Lisa — one should always take care in who she mocks! Akelamalu, I think Ellen has fallen into the Twilight Zone! Oh, this one is good. I love that you’ve given us room to run with this in our imaginations. I’ve given it a shot this week: Irony. Cheryl — that’s always one of my favorite places to leave people! I’m even more scared now Quilly. It sure looks like a scary place! Hope your week is full of smiles. Peggy — just don’t stray off the path and you’ll be fine … I think. I’m just glad you didn’t call out my name! Love the short story. I would love to read the sequel. Church Lady — I think the tombstones are the sequel! EG — you have just stepped in to the Twilight Zone. OooooooOOoo! My goosebumps are goosebumping! I love a good tale from the darkside! SparkleFarkle — it is my pleasure to frighten you. 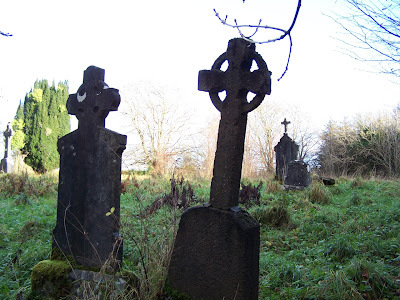 Lost in a grave yard…yikes! Have a great week. KB — and I think this particular graveyard is behind the Hotel California, so checking out might be a problem. Have a great week ahead. Cheers! Sylvia — well common wisdom has it that legends are built on truth. ah ha that’s where they are going to ! Moondust Writer — thanks. I am glad you enjoyed this. Ah, last place I want to get lost in!! But then I’m a big chicken! Great take on the pic of the day, Quilly! Hope you have a great week! Sylvia — I only visit cemeteries at high noon on bright, sunny days! Dianne — if I had gotten lost in a cemetery as a teen I would have been frightened out of my mind! good one! made me chuckle…quilly? quilly? now where did you run off to? Don’t worry, Polly, I’m right here behind my computer monitor. You had it coming, hahahaha!